Only very rarely do I conduct any pre-visit research about the stations that I visit for this project. I let the city wash over me without knowing what’s coming. I let the city surprise me. It invariably does. My research comes later. One exception was my visit to Insurgentes. I was interested in seeking out old Beat Generation haunts so I noted down addresses and to a certain extent planned my route. But usually it is random, unhinged wandering. I find what I find, I see what I see. I miss what is down the path that I don’t take. Station nomenclature may offer a clue about a monument in the area or the history or use of the area. It is just as likely that it won’t, at least to me. The station icons, originally designed to help the illiterate navigate the system, may also give some hint. Today, as I travelled once again down the golden line 12 of the Mexico City Metro System I made a fairly random decision to alight at Culhuacan. I had no idea of the area’s history or significance. I’ll come to that shortly. To start off my afternoon visit, I did a long loop of the eastern side of Tlahuac Avenue. Photographically speaking I found the area to have rather slim pickings. A giant transformer (? ), I think, a mounted horse at a cowboy store, some revolutionary street art, the virgin Guadalupe, a traffic jam and a bright red house doused with a political message all caught my eye. However, for the amount of time spent walking I didn’t reap much photographic reward. On the other side of the station there was far more interest and colour. 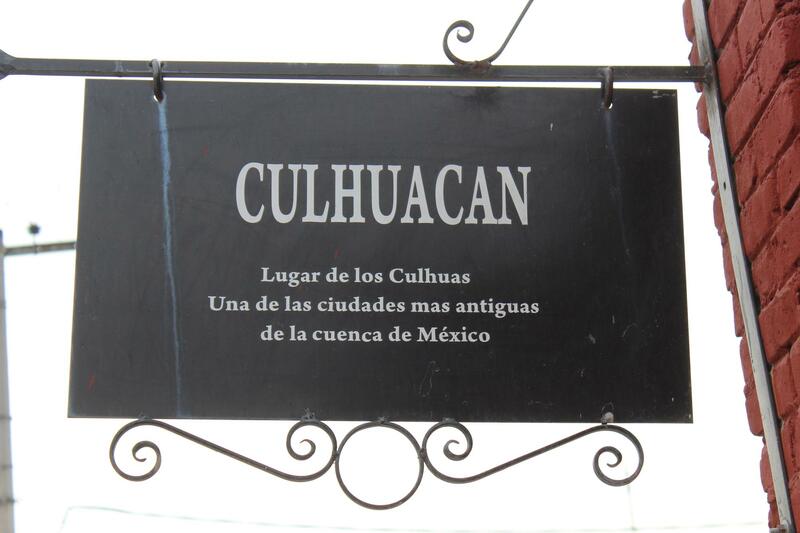 Culhuacan, I now know, was the site of a major pre-hispanic,powerful nahuatl speaking city-state. After the conquest it became an important centre of evangelisation. Read all about it on wikipedia here. Unfortunately, I arrived too late to enter the grounds of the old Culhuacan convent. Instead I spent quite a while enjoying the colourful murals, some of which include information about the history of the area. Es muy raro que hago investigaciones sobre las estaciones que visito para este proyecto. Permito que la ciudad me atreviese sin saber con qué me voy a chocar. Dejo que la ciudad me sorprenda. Mi investigación viene luego. Una excepción fue mi visita a Insurgentes. Estaba interesado en buscar los lugares importantes a la Generación Beat así que noté direcciones y hasta un punto planeé mi ruta. Pero normalmente es vago aleatorio y trastornado. Encuentro lo qué encuentro, veo lo qué veo. Pierdo lo qué está en la ruta que no tomo. Nomenclatura de las estaciones puede ofrecer una pista sobre un monumento en la área o la historia o uso de la área. Es igualmente probable que no ofrece ninguna pista, por lo menos a mí. Los iconos de las estaciones, originalmente diseñados para ayudar a la gente analfabeta a navegar el sistema, pueden también dar una pista. Hoy, mientras viajaba otra vez por la linea dorada 12 del sistema de transporte colectivo de la Ciudad de México, hice una decisión aleatoria de bajar en Culhuacan. No tenía ni idea de la historia o significado de la zona. Pronto hablaré de eso. Para empezar mi visita por la tarde, hice un recorrido largo del lado este de la Avenida Tlahuac. No había mucho para fotografiar. Un transformer gigante (? ), creo, un caballo en una tienda de vaqueros, la virgen Guadalupe, un atasco y una cosa roja escrita con una mensaje política. Todos me llamaron la atención pero considerando la cantidad de tiempo que pasé caminando, no fue mucho. Por el otro lado de la estación había mucho más interés y color. Culhuacan, sé ahora, fue el sitio de una ciudad-estado prehispánica poderosa donde la gente hablaba nahuatl. Después de la conquista llegó a ser un centro importante de evangelización. Lee todo en wikipedia aquí. Lamentablemete, llegué demasiado tarde para entrar a los terrenos del ex-convento de Culhuacan. Pasé un buen rato disfrutando los murales coloridos, de cuales algunos incluyen información sobre la historia de la área. Always great to read Peter! Really enjoying the updates! Thanks Owen. It’s nice to have the support and to know that an old mate is following along. Cheers! You’ve omitted to mention Culhuacan’s most famous former resident. Yours truly. The new station is just metres from my old pad. To which I will return one of these days. Or years. The monastery is in Iztapalapa? Jeez, I knew the border was close. My home is in Del Coyoacan. And you missed getting inside? Well, photography is banned inside. Although if you go renegade, there aren’t too many nuns watching out for rogue photographers. ahh, oops! I didn’t know that. I didn’t see any monuments that told me so! I arrived at the monastery right on 5pm so was denied entry. I just checked out your post and photos which gave me a sense of the space inside. Iztapalapa or Coyoacan, I’m not really sure although the main road next to the station may well divide them so I think the monastery would be on the Coyoacan side – will have to check though.